I've been wanting to ski Liberty Ridge in a one-day push for a minute now. These stupid ideas get in my head and there's really nothing I can do about it. From Ipsut Creek Campground, it's very nearly twelve-thousand vertical feet to the top of Liberty Cap. Big day trips being my forte, how could I overlook this jewel? Mandatory megalomania manifest destiny. Before I get into the minutiae of the trip, please humor me for a minute as I reminisce about the history of Liberty Ridge ski descents. 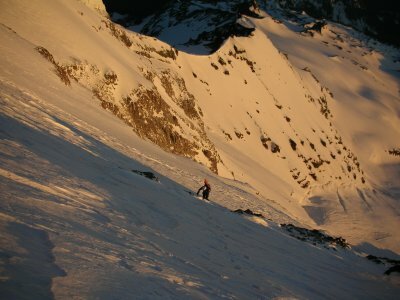 Chris Landry made the pioneering ski descent of Liberty Ridge circa May 10, 1980 during an eleven-day trip with Doug Robinson. They approached from White River Campground with sleds weighing two-hundred pounds. Liberty Ridge was also skied by telemarkers Tom Carr and Eric Hendren in 1983. I tip my hat to Chris Landry. He made quite the run of futuristic descents for a few years there around 1980. But I really wanted to ski the maximum vertical fall line possible. Coming around Curtis Ridge at seventy-five-hundred feet just isn't nearly as aesthetic as skiing to the tongue of the Carbon Glacier, eleven-thousand vertical feet below Liberty Cap. I have no clue whether anyone had ever done such a thing; it's just something that really seemed worth doing. It's too bad our winter attempts in February and March were stifled by route conditions; it really would have been something to ski from Liberty Cap all the way to the car without removing the skis. Oh well, I'm satisfied with what Casey and I accomplished, so that can be a task for somebody else. Casey was a student in one of my labs a few years ago. We've been on a few trips together now. 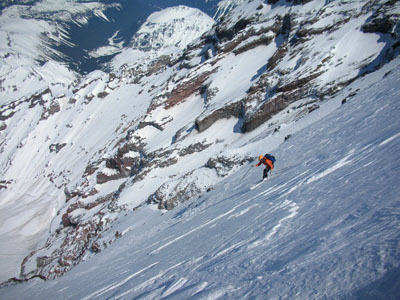 He's a ripping skier and he's in good shape after recent ski mountaineering marathons. He'd never been above the summit of Adams, but I'm not one to discourage. Given that he's willing to hang with me after being subject to my potent combination of incompetence and aggression in one of my labs for a whole quarter, he's clearly faulty enough in the head to accomplish something of this nature. 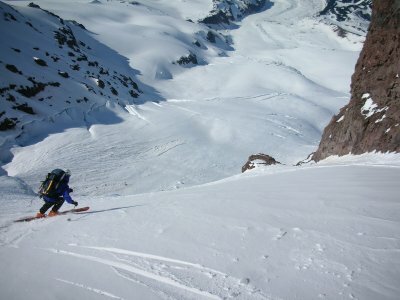 He was still smart enough to know that Dynafits would be the best binding for the trip, so we had some mounting to do. With newly-mounted bindings we left Seattle last Thursday at 3:30pm. Eight-shot Americano in my thermos from Enumclaw Starbucks, we left Ipsut Creek Campground shortly after 7pm. The hike went really quickly with the ample remaining daylight and we even got a few nice views of the mountain before the night-long vigil began. I found a steady drip from the cliffs just before getting on the Carbon, so we supplemented our two liters of water each by chugging a full liter and refilling before hitting the glacier. 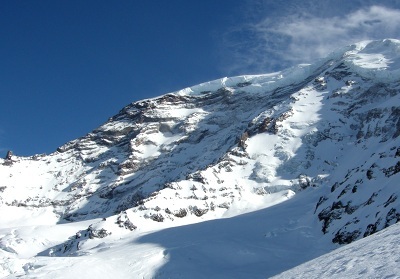 The snow on the Carbon Glacier had been through its transformation well enough to allow easy skinning. The crust supported us quite well and we made good progress. The new moon didn't help, but on the glacier's reflective surface the light from the stars was enough. We were able to navigate sans headtorch most of the way up the glacier. Above 9k it was time to switch gear. We made ready to boot to Thumb Rock. Half the Americano split between us (two shots a piece), Casey was ready before me and took the initiative to start kicking steps. Amazingly it was warm enough to forego the puffy. I caught Casey after about five-hundred vertical feet and took the reins the rest of the way. We took another break at Thumb Rock. It was 4:30 am if my memory serves correctly. We finished the coffee, ate some, and I chugged the rest of my second liter. I ditched the thermos, one water bottle and my ski crampons there. 'Cuz WE'RE COMING DOWN THIS WAY. Casey rounds the corner below the top of the Black Pyramid. We went left above Thumb Rock. Sunrise caught us a little before 12k. The snow was very good throughout this section. Before long we were rounding an icy corner to the long slope that leads above the Black Pyramid. The slope began to ease and we found softer snow to the climber's right. I could see the bergschrund. We took a break to eat and drink a few hundred feet below the bergschrund. There was a relatively easy route over the bergschrund right up the gut. I must have been a bit hypoxic, because at the last minute I stupidly changed my mind and decided to follow what looked like some steps leading left. Casey asked from below, "Does it go?" I was already there and I didn't want to downclimb, "Yeah it goes." It was going, but after making several moves on steep water ice with my skis banging the ice above me, I thought better of introducing Casey to ice climbing fully exposed to the Willis Wall at 14k. I advised him, "Casey, don't come this way!" I donwclimbed to him quickly and traversed to take my originally planned, easier route. I advised Casey to go lower because of a couple spicy moves. It took Casey a long time to do a little downclimbing and I became concerned about his state of affairs. I fetched the rope so we could cross the bergschrund "safely," but several feeble steps on Casey's behalf during his attempt to join me revealed that he would not be climbing any farther. I didn't want to leave him. I considered descending. But I couldn't do it. I wanted it too bad. I left the rope and some screws where I was. Casey downclimbed to where we took our last break. "Are you all right Casey?" He assured me he was all right, but he needed to save something for the descent. That seemed like a mighty fine idea to me. "I'm just gonna climb above the bergschrund. I'm leaving the rope and screws here for you in case I don't return. I'll be right back." I crawled over the bergschrund on all fours. There was a sixty-degree snow slope that crested the ridge. I could see Casey until I rounded the crest. Once over the crest, there was no way I could stop. I booted frantically toward Liberty Cap. StepStepStepStepStepStepStep; stop and pant and listen to my heart pound. Repeat. I reached the cap before too long. It had been incredibly warm on top. The usually-hard sastrugi was very soft. Somehow I convinced myself that the ice on the route might have softened. I took a break with Casey and we prepared to ski. It was his first time stepping into Dynafits and he had a bit of trouble. The skiing from our break spot was incredible: relatively low angle, good snow, and five-thousand feet of exposure. Sky enjoys the descent circa twelve-thousand feet. When we got to the ice, it hadn't softened a bit. I quickly retrieved one of my axes. The ice was scary. Too scary to sideslip. 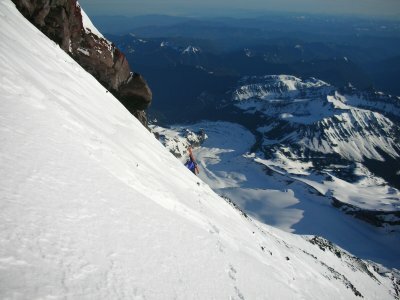 It would be a tricky transition on the steep slope, but I decided to change into my crampons to downclimb. I swung my ax hard so that the pick went all the way into the ice. I tried to get my downhill ski as set as it could be. I carefully removed the uphill ski and lodged the ski brake into the ice above me. Then I kick-kick-KICKED until my uphill boot had a bit of purchase. Next came the scariest part. Reach down and remove the downhill ski. I VERY carefully lodged it in the ice too. Then kick-kick-KICKED until it had a little purchase. Once I got the crampon on my right boot, everything was all right. In the meantime, Casey had put himself in a worse position where it was even icier. I had instructed him to the ax-in-ice, one-ski-off step, but he was having trouble from there. I secured my pack to my second ax and swiftly moved across the ice to help Casey. I helped him remove his skis and got his crampons on his boots. Now all we had to do was downclimb to the softer snow. I downclimbed rapidly to the top of the Black Pyramid. The snow got softer a little before the top of the pyramid, but the rocks of the pyramid provided a nice flat spot to change into skiing mode again so I went to the rocks. I'd estimate we downclimbed five-hundred feet, all told. Casey falls down the mountain in graceful arcs. I took a half-hour nap waiting for Casey to finish his downclimb. It was a very strange sensation to wake up from a dream at one point, feeling precariously perched before opening my eyes, to open them and see the spectacular vertiginous views. Casey reached me safely. He apologized for taking so long. "Don't apologize! I'd much rather you take all the time you need than see you hurry and fall." Casey offered to take my camera and play photographer for the next few sections of the descent. The snow was good from where we were. The exposure looking down Thermogenesis and Willis Wall was incredible. The rest of the descent was amazing. We had good snow everywhere, except where we climbed left above Thumb Rock. That section to the east of the rocks was in the shade and had an icy crust. Below Thumb Rock was absolutely perfect corn. After retrieving the stuff we had left, I remarked to Casey before we began to enjoy the rest of our wet sloppy booty, "You know, we still have seven-thousand feet to ski." We both made it to the car before the twenty-four-hour mark. I don't know what's next, but I'm still hungry.